Are you finding your home is becoming a little crowded? With the rising cost of moving house and difficulty securing mortgages the solution could be to convert your loft, garage or basement to provide you with the extra space you require. Converting an unused loft or basement within your property will not only provide you with more space, perhaps an extra bedroom, annex or office, but will also add value to your home. Acorn Building Solutions are extremely experienced in the conversion of both domestic and commercial spaces with no project to big or small. Acorn Building Solutions will project manage all elements of your conversion from design and planning including regulation checks and inspection, completing the conversion with the aim to cause as little disruption to your daily lives as possible and finally finishing the interior design providing a result you are completely satisfied with. This said it is hardly surprising that Acorn Building Solutions hold a highly professional reputation as conversion specialists across Plymouth and the South West. 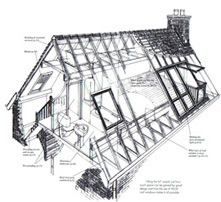 At present the law requires planning permission for any loft conversion that is to incorporate a dormer extension, permission for this type of conversion is usually only granted for construction at the rear of your property. Planning permission is not usually required for any loft conversion that is to incorporate Velux windows. We use expert architects help design and draw the planned conversion taking into account the surrounding properties as to provide the best chance in obtaining successful planning permission. 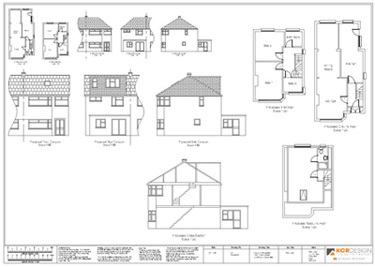 Our Architect will provide you with a full copy of the planning drawings for your perusal. No drawings will be submitted to the local authority until you have confirmed they meet your specification. Every conversion we complete must adhere to current building regulations, our team are fully experienced in all elements of safety and there should not be any issues surrounding the building regulations for your project. Most of us go about our daily lives using our lofts for storage purposes only, a place to store old baby toys and the Christmas decorations without giving a second thought on how to best utilise the space to our advantage. Converting your loft can provide a vast amount of extra space which can serve many different purposes. Many of our clients choose to make this space into an extra bedroom either to use for guests or due to an expanding family, but it can also serve as a home office or even as a master bedroom with en-suite facilities. When converting your loft space there are several different methods that can be used, each varying greatly in price and the amount of space they provide, below is a basic overview of the most common options available. The cheapest method is to create a Loft Window conversion which depending on the overall size of your loft could provide a single bedroom or office space. If you require a lot more space within your loft then the option could be to have a Dormer Conversion. This will lift part of your roof either on one or both sides, placing a vertical window within the roof making your conversion a lot lighter. Both the methods listed above can be unsuitable in lofts that have three sloping sides such as those found in end of terrace properties. In this case we would recommend a Hip to Gable conversion in order to maximise the space available to you. Acorn Building solutions are willing to answer any questions you may have about converting a space within your property and are happy to provide a free non-committal quote for your needs. We are also willing to work to your budget, you tell us how much you want to spend and we can provide for that amount. Acorn Building Solutions understand the desire for a high quality finish in as short a time as possible. Our team are trained to be able to work within a set time frame with any unforeseen issues being dealt with quickly and effectively to avoid any job over running. After your project is complete Acorn Building Solutions offer an extensive reactive maintenance team who are able to help maintain the quality of your extension and are available on call out should you have any concerns. With a full 10-year structural guarantee on all Acorn Building Solutions loft conversions, you can be sure that your project is built to last and have complete peace of mind. We can offer a full maintenance service to help with the upkeep of your new loft conversion and also provide you with a emergency call out number should any unexpected problems occur. Acorn Building solutions will work closely with you to explore the endless possibilities that are open and available to you when designing your conversion. We will also take into consideration a few important factors that can affect your finished project. The first factor that needs to be considered is light. You most likely want your conversion to be light and airy so it is important you consider the intended use of the conversion and whether it would benefit from being situated at the front or rear of your property with regards to sunlight. Loft conversions are rarely adequately lit by natural sunlight so we would suggest you consider the purpose of your conversion with regards to the positioning of windows. This will ensure you benefit from the maximum amount of available natural light and in turn reducing your energy bills. The positioning of windows within the extension can play a huge role in the amount of light. Acorn Building Solutions suggest placing the same number of windows on opposing sides of the extension in order to receive the greatest benefit from natural light. Placing Velux windows with a loft conversion can affect the heating of your home during cooler weather so consideration would need to be given as to whether to install radiators within these rooms, under floor heating is a great alternative to radiators if space is limited. When considering your conversion you must take into account the remaining space and ensure you have enough storage remaining to meet your needs. Acorn Building Solutions are able to help you visualise how your extension will finally look by providing you copies of architect drawings and where possible plotting your conversion parameters within your loft. Finally be aware that any plans you make that require permission can be objected to by your neighbours. We advise our customers to consult any neighbours who may be affected before submitting the final plans and be willing to compromise. Areas we carry out home extensions include Plymouth and the surrounding areas.